Connect the Piccolo Xpress to your EHR! Relaymed is the first affordable, automated POC connectivity software solution for the physician office laboratory to interface the Piccolo Xpress chemistry analyzer. Now you can ensure your practice gets real-time results into the EHR. 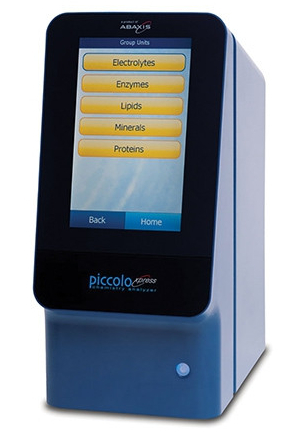 Abbott Point of Care are the exclusive US distributor of the Piccolo Xpress Chemistry Analyzer. And we’re very proud to partner with them to offer POC connectivity for their outpatient market. The Piccolo Xpress is a portable clinical chemistry system designed for accurate, near-patient testing. It provides lab-accurate results within minutes for a wide range of clinical chemistry needs. The menu features 31 blood chemistry tests that range from liver, kidney and metabolic functions to lipid, electrolyte and other speciality analytes. The full test menu is supported by Relaymed. No longer do Abbott Piccolo Xpress clients in outpatient or primary care need to buy expensive and complex POC data management software systems, not suited for their needs. And you definitely do not need a laboratory information system! Relaymed is designed specifically for the physician office laboratory, streamlined with the features you need. The Piccolo Xpress is one of the most popular devices connected by our clients today. Why? No more paper! Transcribing from paper printouts was a laborious task with opportunity for error. Results are automatically sent direct to the EHR, so no longer does a staff member need to manually enter. No more waiting! No longer does the staff member need to set an alarm or try to remember to circle back to the analyzer after the result completes in ~12 minutes. As soon as the result is ready, Relaymed transmits it automatically into the EHR where it is instantly available for the ordering provider. This means staff members can be way more productive with their time instead, providing added value through patient check in / out procedures or managing referrals. Sound good? Like to learn more about our interface with the Piccolo Xpress? Request a 15-minute demo today (that’s all it takes!) and you too could be saving hours of time and improving patient care.